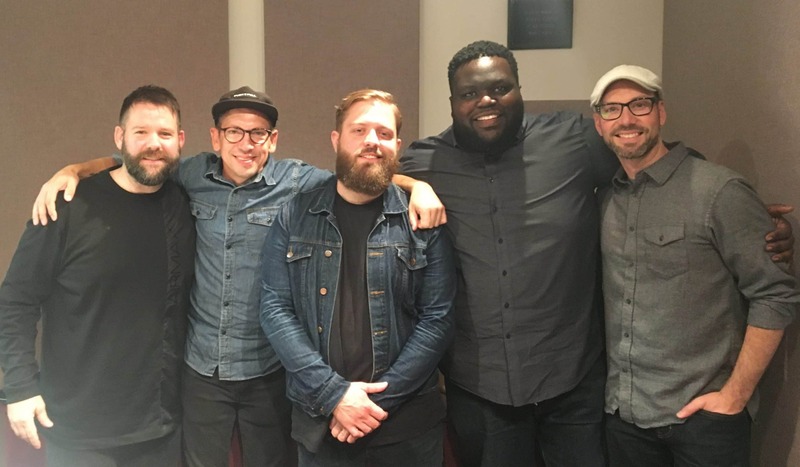 City Gospel Movements had the honor of having 5 leaders from the Portland Worship Leaders Network on our podcast. Listen or read about it below to find out how these men have fostered unity in their network. How did this Network form? Paul: 13-14 years ago, there were other lead pastor networks. I was a college pastor at the time and there were no college pastor networks. I reached out to a friend of another network and asked if I could start one and he encouraged me to. I wanted a place where pastors with the same value and inherent passion as me were, a place where we could be learning from other people. Then I became a worship pastor and felt that same passion to have a network with worship pastors. We gathered some friends together and started meeting at a coffee shop in the Pearl District. First we were talking about guitar pedals, sound systems and musical excellence. This was great, but we needed to lay some groundwork about what this was for. It is a space to talk about how you are doing in your role, how is your soul and relationship with your pastor. How Many come to the network? Aaron: 10-20 are committed monthly, but depending on availability and who is speaking we could have as many as 50-75. When I showed up I was burnt out and having panic attacks. This group of people was a safe place for me. There aren’t any egos, everyone is for each other. I have gained valuable wisdom from them and safe friendships that I could trust as I am ministering in my church and they are ministering in theirs. What does the Word Unity Mean to you? Jake: It’s Gods’ desire and heart. We come together once a month as a unified group and to be led by one of us. Its an opportunity to unify in one voice with songs. The great thing about unity is that there are all different kinds and sizes of churches, but we all have issues. We come in at the same level and talk to one another. This gives us a vision about what God wanted the church to be like. Mike: This group here is stepping into that unity. Racial diversity is not huge, theologically there is though and people come united with Christ. It is beautiful to see us live into unity, cherish it and value it above the things divided in the world, especially the church world. We don’t agree on everything, but we are united in Christ and in our struggles. I grew up in a black Pentecostal church and it took me awhile to get used to this. Do I really fit here? These guys welcomed me and it was clear they wanted me there. Growing up there was no such thing as a worship pastor. They had full time jobs, families and served as minister of music. This Wednesday meet up would be impossible, so how can I be that bridge to them? We are committed to unity amongst ourselves and churches. Being apart of something and then taking it back to our places of worship. How has the unity amongst you impacted your churches? Tyler: We start to think the same way with our church and staff in the local context. In these Wednesday meetings we see similar things happening, but from a different vantage point. For example, we started being hyper focused about our verbiage at my church. We saw it one way, but when I talked to the group about it they helped me see it in a different way. It helped my church to minister to more people because we have this sounding board of leaders. In the network you have this sounding board of 12-20 worship leaders who you can bounce ideas off of. Leading up to an event or time of year we can say what are you doing, how are you doing it and why are you doing it this way? What can threaten a Network from being unified? Paul: Facebook [lots of laughter]. Seriously though, on a Facebook group there are thousands of people and rarely you get anything that’s worth something deeper. For any network, the biggest threat can be other people’s agenda that they bring into the network. The core conviction of the group needs to be clear. In ours, we have specifics of what this should be. Jake: At our network everyone in the room is being pursued. What breakdowns unity is if for some reason this small church person might not get pursued because other big church leaders are there. No matter who you are you feel safe in the network. This makes it a safe environment for people are coming with their baggage or issues. No matter where you are coming from there is unity that is amongst us because we are sons and daughters of the king. This team has done an incredible job with connecting with people and asking, “how are you doing?” One reason is that we are friends, we are unified as friends and we want them to feel connected to the whole group. The leadership team is of utmost importance. Leadership has to represent what you want. How does a group of like minded professionals not be competitive? Aaron: You’re using the word professional really generously [laughs]. It takes realizing you can’t hold tightly to the people that God brings your way. You can’t hold onto the things God gives you rather than holding onto God. It takes having a bigger mindset. It can be easy to get lost in the weeds. The big k Kingdom becomes the little k Kingdom. Everything becomes about preserving the 4 walls in your church and not what God is doing in the church in Portland. These meetings allow you to see what is happening. It is encouraging to me personally, but I also see that this is not all about me. It is about seeing what God is doing. 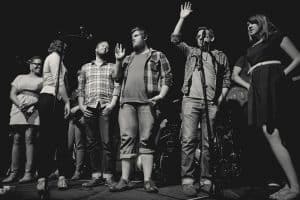 Mike: It has been one of the most beautiful things because although worship leaders can be seen as the rock star of the church, on these Wednesdays, no one wants to be that. Leaders have done a great job about keeping the main things the main things. If there is that ego that creeps in the climate is of such that it doesn’t allow it to creep in. This space is where the rock star goes home and takes it all off. This is where you can be real and be you. There is not a spirit of competition because at the heart we are seeking the heart of God so there is a contentment with what God has blessed us with. Contentment with what God has asked us to steward and we have to think then, what am i jealous of? I cannot be. The success in this is faithfulness to Christ. Jake: When it comes to competition, the older I get, the more I am made right in Jesus. I see my brokenness and sanctification is working in me when I recognize the righteousness. Through this, God is revealing how he wants to refine me. We are all being sanctified to be like Jesus because we are all broken. We come, are honest and let our walls down because in our local communities there is pressure to have it together, but when you walk in on Wednesday, we are just who we are. I’m just Jake there. Paul: I think ego is the problem. Ego is attached to music in our culture. It is a built in cultivator for ego, essentially a petri dish of ego. There is nothing that disarms ego more than friendship because the more known you are the more ego goes away. David walking into Jerusalem, basically here (Beaverton) to downtown Portland. When David arrives, he takes his robe off because what he is doing is saying, “God I am nothing before you, I am not a king, I am a priest.” That is what we are doing to break down ego. Is worship the secret to unity? Matt Maher, worship leader and songwriter, shares his thoughts on Jesus’ prayer for unity. Several thousand people representing more than 250 churches gathered in Columbus, Ohio for an evening of all-city worship in April. 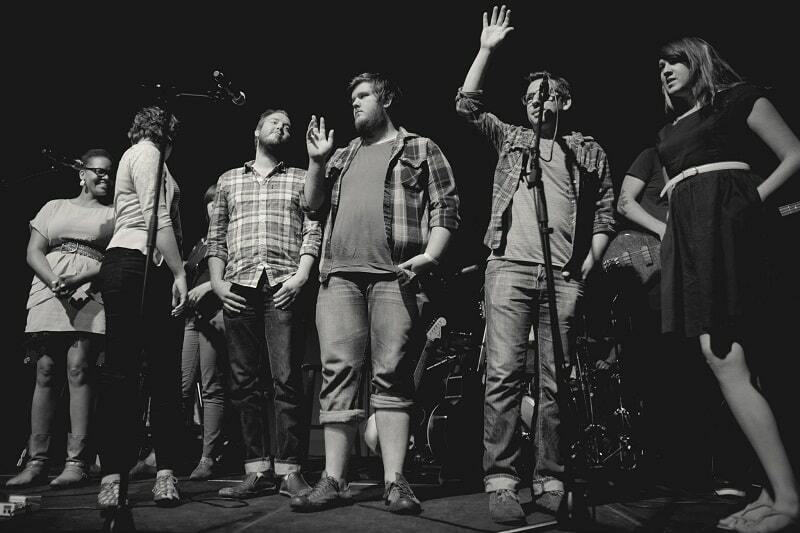 Check out this article I found at City Gospel Movement's website https://citygospelmovements.org/resource/no-space-for-egos-in-this-worship-leaders-network/. And maybe that’s the key to these genuine friendships.